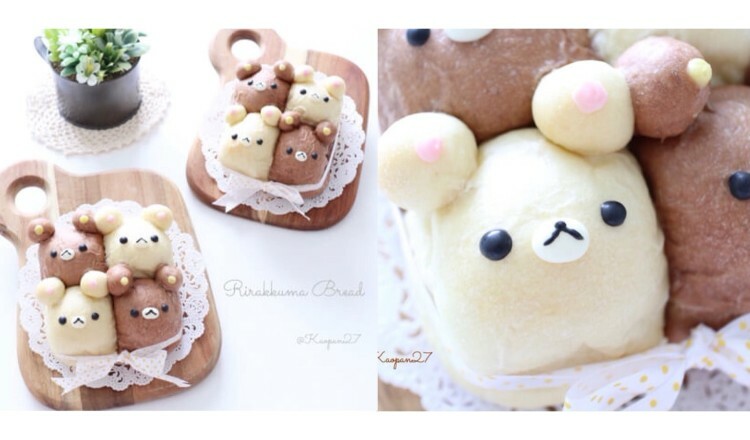 In this recipe, you’ll learn how to make cute tear & share bread of the character Rilakkuma! First, you’ll need to make a pack out of a milk carton for the mix later. 1. Open up a milk carton that you have washed and cut it into a cylindrical shape. 2. Staple together your pieces from Step 1. 3. 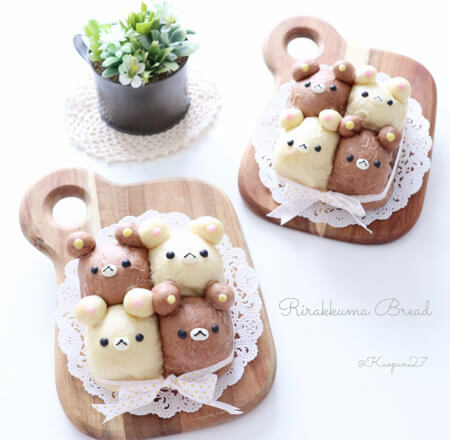 Now, staple them together into a square that measures about 10-12cm. 4. Wrap with aluminium foil. Now, onto making the bread! 2: Put the strong flour, dried yeast, salt and sugar into a bowl. 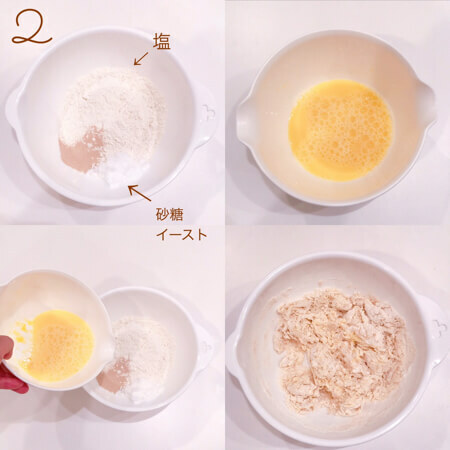 ☆If the salt (塩) and yeast (イースト) are put side by side it will be difficult for the mix to rise to keep them separate. Mix the lukewarm water and egg together. Aim at the yeast and pour into the mix, then stir with a wooden spatula until it’s no longer floury. 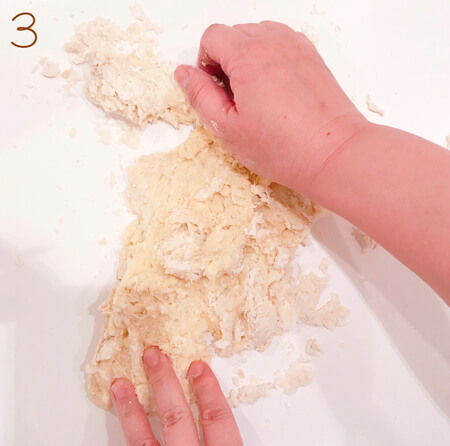 3: Take out the flour once it’s at a point where it’s no longer floury, add the unsalted butter and knead with your hands. 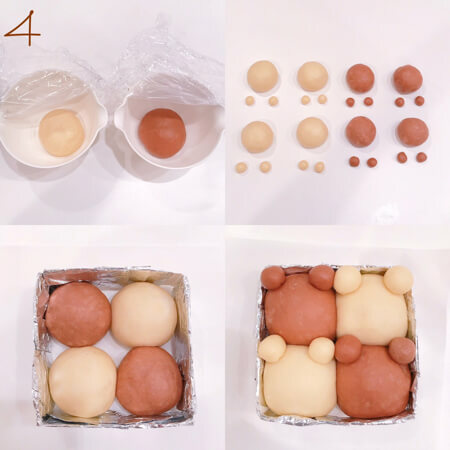 4: Once your dough in Step 3 is mixed together, split the mix in half, and roll one of those halves as it is into a ball. 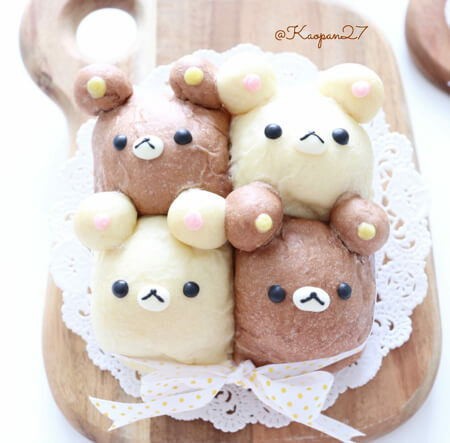 With the other half, mix it bit by bit with the cocoa powder that has been dissolved in the lukewarm water and shape into a ball. Leave them to rise for 40 minutes. Once they have risen, divide both the plain mix and cocoa mix into 4 pieces (my pieces weighed 53g). 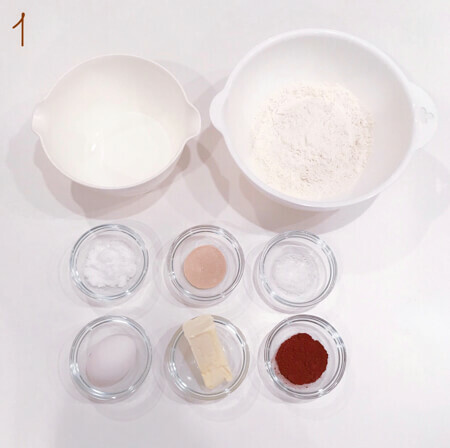 ☆The amount of grams will change depending on the way you have kneaded it and the temperature, so it’s better to divide them into 4 after having measured their weight. 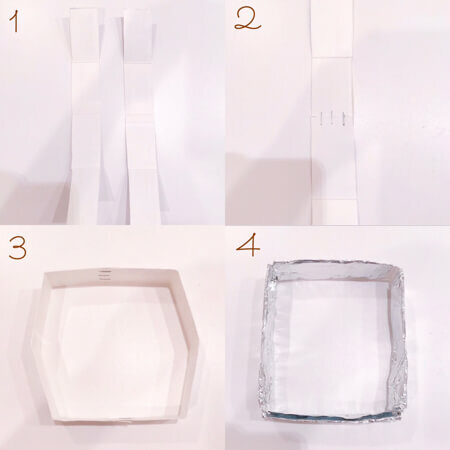 Make ears from your 4 divided pieces (2g each). Once you’ve finished diving each part, line them up like in the photograph to set aside for 10 minutes. After 10 minutes, put them into the pack you made in the beginning. ☆Don’t put on the ears yet. Once they’re in, leave them to rise again for another 30 minutes before on the ears. 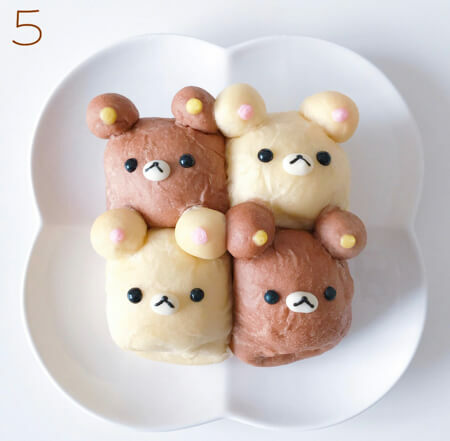 5: Once you’ve completed everything in Step 4, place them into a preheated oven at 180℃ then lower the temperature to 150℃ and cook for about 7-minutes. After that, so they don’t take on a brown colour, take off the aluminium foil and cook for a further 10-minutes. 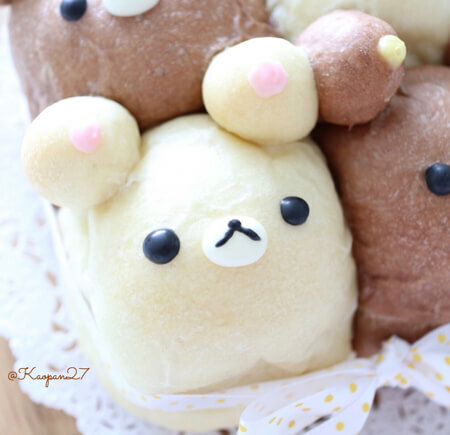 In this recipe I made the bread with 2 different kinds of batter, but you can make it with just plain if you like and it’ll be plenty kawaii. If you wrap them with a ribbon they make a perfect present!